Tech Tent: Will Apple ban that Saudi app? 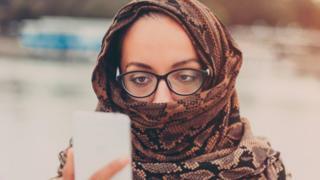 Smartphone apps have transformed many areas of our lives, but in Saudi Arabia they are being used to curtail the rights of women. On the Tech Tent podcast this week, we ask whether it is the responsibility of technology companies to make sure their platforms are not used by governments to repress their citizens. In Saudi Arabia, women need permission from a male guardian - usually a father or husband - to travel abroad. A smartphone app called Absher, available for Apple or Android phones, gives access to a number of government services. It also allows men to approve or refuse permission for overseas journeys made by women. Recent stories of women who have managed to leave the country against the wishes of their male relatives have highlighted the role technology plays in policing their movements. Rothna Begum, senior women's rights researcher at the campaign group Human Rights Watch, explains how the system affects every Saudi woman when she travels. "She can't leave an airport without permission being provided. The authorities will know whether or not she has been granted permission. If her guardian has asked for notifications, when she's left the airport, he will receive an SMS text alert," she explains. Salwa, a young woman who fled Saudi Arabia last year, told the BBC she managed to get out after getting hold of her father's phone. She took it when he was asleep, and clicked on the "forgot password" link to steal his identity. "I changed the number of my father's phone to my phone number, and I made a consent for me and for my sister," she says. According to Rothna, app store providers should be showing that apps are not facilitating abuse and discrimination. She has called on Apple and Google to act. "Now that they've been alerted to it, they could go back to the Saudi government and tell them to remove the functionality that is allowing men to control and track women." Removing the app would not mean the end of the male guardianship system. The Saudi government's web portal has the same functions allowing the tracking of women. But Human Rights Watch believes action from the tech companies would increase the pressure on the government to get rid of the system. Apple and Google could well argue that it is not their job to determine the laws of the countries where they operate. But, as with their dealings with China, they will also be aware of the reputational risk of putting commercial interests ahead of the values they claim to espouse. Apple says it is looking into the Absher app. The BBC has contacted Google about this issue but has yet to receive a reply. With a new book called The Age of Surveillance Capitalism making waves, we ask whether the business model of Google, Facebook and thousands of other companies involves the invasion of our privacy.